First Portia's late unlamented husband left her penniless, then his nip-farthing brother dumped her at Ashburne Hall to decay. If mice in the walls and holes in the roof aren't bad enough, someone wants her to believe the place is haunted. But Portia doesn't scare that easily, even if catching sight of the brooding ghost leaves her strangely breathless. When he was accused of murdering his fiancée a decade ago, Giles Ashburne fled the country to his supposed death. Now he’s returned to the Hall to uncover the evidence that will exonerate him, only to find himself playing a ghost in his own home. Nothing he does drives Portia away, and worse, the stubborn chit is starting to grow on him. The more Portia learns about Giles Ashburne, the more certain she becomes that her ghost is not only innocent, but far from dead. When she sets out to prove it, she puts herself on a crash course with not only Giles, but the real killer. If Giles and Portia don't learn to stop striking sparks off each other and work together, there will soon be two ghosts at Ashburne Hall. After the death of her husband, Lady Ashburne has been sent from her home by her brother in law to live at the Family home Ashburne Hall. 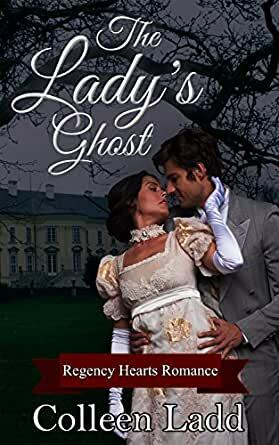 When she arrives she learned that it has had no care in the last ten years and is extremely run down, but worse than that, she has to deal with an all edged cranky ghost. All she has to work out is who is behind the alleged ghostly pranks and deal with them. 4.0 out of 5 starsGood bargain buy. Polished writing, interesting story and characters. This is a Regency romance/mystery with a bit of a gothic overtone (but not really). There's a ramshackle estate, a mysterious, elusive (perhaps a ghost?) hero, and an impecunious heroine Portia, widow of Roger, the late Viscount Ashburne, who left her with nothing, not even sadness that he is deceased. And to top it off, the new viscount and his wife have sent her off to languish at Ashburne, the ramshackle estate already mentioned. Giles Ashburne, the viscount before Roger held the title, was a man with an unsavory past, believed to have murdered his fiancee on the night of their engagement party. He had then fled the country by ship, a ship which sank, drowning all occupants. Everyone who believed him to be guilty (and that's a lot of people, including his fiancee's guardian) let out a sigh of relief upon hearing of his death. Portia arrives to an unwelcoming house and unpleasant, uncooperative housekeeper couple. They do their best to make her feel uncomfortable, hoping she'll turn right around and march back where she came from, not realizing there are no options for her. The house is dusty, dirty, mildewed, full of mice, spiders and cobwebs and holes in the roof and it seems it is even haunted. Well, hah to all that, thinks Portia, who, along with her faithful maid, begins to make the house liveable. And hah to the ghost also. There's no such thing, says our redoubtable and admirable heroine. There's a mystery here, of course. Did Giles kill his fiancee? If not, then who did? The mystery itself doesn't hold up to a lot of scrutiny, in that as we learn more about the murder and its motivation, it seems pretty obvious that it would have made a great deal more sense to have murdered someone other than the actual victim. But if the murderer had acted in a logical manner, we would not have had this story. There's also a romance. The romance is a bit unusual in that the H and h don't actually meet until about 60% into the story, yet the H manages to make some annoying assumptions about the h w/o even having met or talked to her. Misunderstandings and Failure to Communicate without ever meeting? Nonetheless, he will improve as the story goes on. There's also a good bit of humor. Inedible food. Things that go bump in the night. Objects being moved from one place to another. Disappearing clothing. Strange goings on in the library. The reactions of the maid are rather priceless to all this, while Portia is almost preternaturally unperturbed. I believe this was released in June of 2014. I'm glad it was offered for free this week. It was quite the find. Very good writing, interesting characters and story, and it was pretty much free of errors. No grammar mistakes, spelling errors or typos jumped out to annoy me. 5.0 out of 5 starsHEA? Most likely. A really fun read! I really liked this story. Romances are great but without an intriguing story, I lose interest quickly. This was NOT that book. I couldn't put it down but had to force myself away to work, eat and sleep. But then I picked it right up again. I wished the ending wasn't so abrupt and there was an epilogue that helped explain what happened to the H and h after. But from the hilarious beginning to the romantic end, I really enjoyed the characters, their development and the tension between the H and h. The male lead was a bit obtuse at times, and I find it difficult to believe that a duke's ganddaughter would be so penniless. The villain was expected but getting to unmask him was fun. 5 stars for bravo in everything, maybe minus .5 stars for the ending. In the end, I'm not sure if they even had a bedroom scene aside from that little closet space which may have ended abruptly, but I really wished I could have seen justice be done and everything set to rights while our spunky heroine set down her cruel in-laws only to become, legitimately, Lady Ashburne of Ashburne Hall. I really would have liked to have seen/read it. 4.0 out of 5 starsI Would Have Left When Mice Took Over the Bed! This "ghost" story starts off extremely well. The tale begins as an old-fashioned, Georgette Heyer-style novel, but plays with the usual conventions. The heroine, for example, swears like the proverbial sailor (although the actual words are left to the reader's imagination), using language she picked up from her deceased husband, in spite of the couple spending very little time together. What begins as a witty, spritely melodrama takes a turn for the worse once the "lady" and "ghost" meet in person. They rapidly fall in love and into bed (a small, uncomfortable camp bed) and originality and humor are replaced by cliche-ridden passionate prose. I never know how to rate books that begin wonderfully -- this one deserves 5 stars for more than half the book -- and fizzle down to a pedestrian 3 stars at the end. Average those and get a 4 star read. First of all it was delightful to read an eBook that was well-edited since so many are full of typos and grammatical chaos. It was also extremely well-written. I tended to get annoyed with Gile's bad attitude in the beginning, but as the story unfolds you realize he had every right to feel that way. Adored Portia. She is the kind of strong and determined heroine that makes this type of book really enjoyable. I doubt I could have held up under the circumstances she endures and struggles through. Definitely one of the best books I have read in quite a while, and I read a lot! It was better than good but not quite up there with Beaton or some of the classic authors, however, I would give it a B++. Ir was fun, enjoyable, with some slips and turns but the characters were delightful, the twists were fun. I shall surely read this author again. While there were a few errors, nothing at all to interrupt the story, and by today's book standards I would say it was neigh on perfect. It really is so nice not to have misspellings, grammatical errors and missing words on every other page. For that I applaud the author and editor.